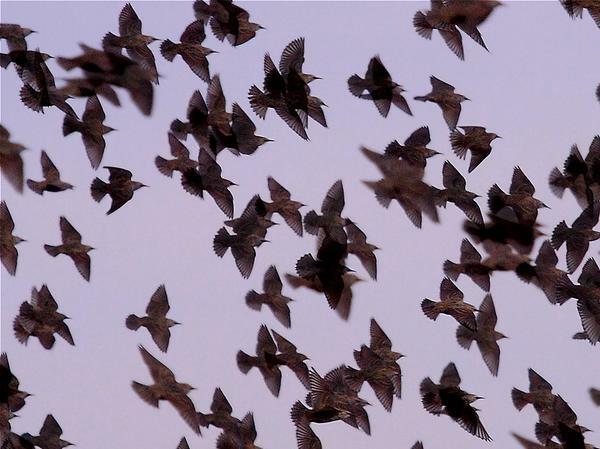 I’m sure you’ve seen starlings fly away to avoid a predator. Have you heard their warning signal? Over the years I’ve noticed that European starlings (Sturnus vulgaris) make a spitting sound just before they flee. Sometimes only one or two birds call the alarm, a sharp note repeated three or more times. It sounds like this. When I look for the reason they’re making the sound, I always see a hawk in the air. I’ve learned to look for a raptor when I hear that sound. I live in Munhall (above the Waterfront) and haven’t seen many birds this time of year, except just now I saw about 60-80 of these brown and white speckled birds on the electrical wires, flying in large groups and also landing on house rooftops. I am wondering if they are starlings, but not sure. Hoping to send you a picture, can you send me an email and I’ll send it? They are around a robin size, kind of chunky little fellows, but very pretty speckles! That’s them! They really are pretty, but I don’t recall seeing them en masse like this LOL. By the way, we also get a few stray crows too this time of year, but not like they have them in Oakland! My cat is afraid of them! Thanks for confirming the starlings and congrats on your award! I’ve been reading your column for years and appreciate all your information!